Jesuit Fr. 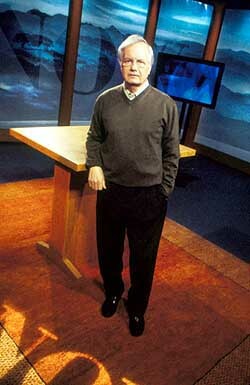 Raymond A. Schroth, NCR media columnist, interviewed Bill Moyers by e-mail in mid-June. NCR: You often mention your years in the seminary but not in much detail. How formative were they in developing your political and social philosophy? To what extent has your own theology influenced your decisions in journalism? MOYERS: My years in the seminary were decisive for several reasons. I spent my first year at the University of Edinburgh in Scotland where I sat at the feet of some of the great divines of the time -- masters of homiletics, New Testament and ecclesiastical history. It wasn’t what they taught that influenced me so much as what they encouraged me to read -- books in particular on the history of relations between the church and state in some of the cataclysmic periods of European history. The sort of things many people had come to America to escape. For a boy who had grown up in the small world of a Protestant culture in East Texas, where there were more Baptists than people, it was eye-opening stuff. Soon after arriving there, I heard one of the great lectures of my life, by John Burleigh, on “What Does Athens Have to Do with Jerusalem?” Then returning home to a Baptist seminary, I fell under the influence of one of the great-souled ethicists in Baptist life, T.B. Maston, who believed and taught that the Christian story was not only about faith but about its impact on our social and political lives. That small town where I grew up was half white and half black -- one of those places where it was possible to be well-taught, well-churched and well-loved and still remain ignorant of what life was like for people across town. Your May 19 address to the Newspaper Guild is a particularly blistering attack on the growing corporate dominance of the media. And pessimistic. Is this an inevitable process or are there concrete steps both legislators and journalists can take to stop it? Corporate media today is deeply compromised -- worse, corrupted. I’m not sure it can be redeemed, which is why we have to make sure the Internet does not fall under the same mega media companies that now control broadcasting and publishing and, if they could, would seize the gates to the Web. We have to fight for a strong and independent public broadcasting -- and that means a trust fund to remove it from political and corporate influence. We journalists have to engage the mainstream, not retreat from it -- get our fellow citizens to understand that what they see, hear and read is not only the taste of programmers and producers but also a set of policy decisions made by the people we vote for. We have to fight for local and community-based content to be heard rather than drowned out by nationwide commercial programming. We must restore sensible limits on multiple and cross ownership of TV and radio stations, newspapers, magazines and other information sources. And journalists have to become outraged at the profaning of our craft; one journalist alone can’t extract from an employer a commitment to let editors and not accountants choose the appropriate subject matter for coverage. We need news councils to blow the whistle on dishonest, ideological, shoddy and cowardly management. We need local journalism reviews to make a stink when local papers and broadcast stations abuse the public trust. Above all, we have to realize that journalism and democracy are deeply linked in whatever chance we Americans have to redeem our grievances, renew our politics and reclaim our revolutionary ideals of a society based on social and economic justice. Ken Auletta’s June 6 New Yorker analysis of the increasing pressure from the Bush administration on public broadcasting is also frightening. To what degree is the survival of “Now” -- with its current guiding spirit -- protected? “Now” isn’t really protected beyond 2005 -- if that far. Right now PBS is going through a severe budget crisis that could leave programs like “Now” subjected to cancellation or in such a weakened position they are no match for the onslaught of right-wing programming that it appears is headed our way. I teach journalism at both St. Peter’s College and New York University. Please give us two or three books that every young journalist should read in order to become a great old journalist. Oh, so many, many books go into the making of a journalist. But start with Tom Paine’s Common Sense and Walt Whitman’s Leaves of Grass -- the first was the journalistic voice of the American Revolution, the second the poetic journalist of the democratic promise. Read all of Page Smith’s A People’s History of the United States for a grasp of the grand sweep of this country (with a bottom’s up view) and as the work of a wonderful writer who was grounded in the past but served the present because he felt obliged to the future. Then top it all off with George Seldes’ Tell the Truth and Run by one of the great journalists of my time. It never hurts to keep going back to E.B. White’s Elements of Style, although the very recent Eats, Shoots & Leaves by Lynne Truss is more fun and quite helpful.